The output of the three processes timing and pitch control features can be seen to some extent in the processes' output track in the multi-track display mode, as shown below in track 2 (named "Audio 2"). But in most cases, we recommend LEFT CLICKing the Full Height Track toggle switch shown in the picture above to achieve more detailed displays similar to the picture below. The Output of the three processes will contain the main elements and controls for Timing and Pitch warping that are identified in the Full Height track display shown below. 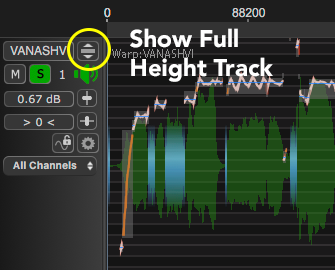 To return to the multi-track display, LEFT CLICK the same "Show/Hide Full Height" button.